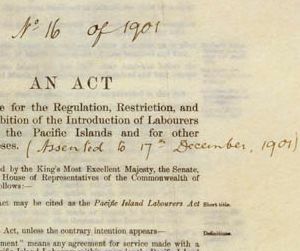 The Governor-General signed this Act 'to Provide for the Regulation, Restriction and Prohibition of the Introduction of Labourers from the Pacific Islands and For Other Purposes' on 17 December 1901. 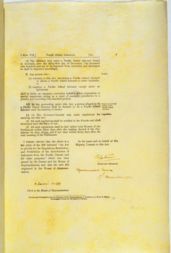 This document enacted a law to deport the vast majority of the Pacific Islanders in Australia from the end of 1906. Pacific Islanders could still enter Australia, but only under licence as indentured servants, and only until 31 March 1904. In its first year the Federal Parliament produced a package of legislation which marked out the racial boundaries of the new nation. The Pacific Island Labourers Act enabled deportation of most of the Pacific Islanders working in Queensland and northern New South Wales as soon as possible after the end of 1906. The only Pacific Islanders allowed to stay in Australia were those brought to Queensland before 1 September 1879, those working in ships’ crews, and those granted Certificates of Exemption under the 1901 Immigration Restriction Act. The Bill was debated extensively during the October and November sittings of both Houses of Parliament, with several Members seeking to ameliorate the harsh terms of the exclusion. The Bill was passed by the House of Representatives and by the Senate, and assented to by the Governor-General on 17 December 1901. Some 10 000 Pacific Islanders were living in Queensland and northern New South Wales when the Bill became law. Only 700 of them were exempt from deportation. The Act was intended as an instrument of mass deportation after the end of 1906, but also imposed progressive limits on immigration and encouraged emigration before that date. In 1902 Islander immigration was limited to three-quarters of the number who had returned home during 1901. In 1903 the number admitted dropped to half the number of 1902 returnees. No agreements were valid after the end of 1906 and any Islander found in Australia who had not been under an indenture agreement within the previous month was to be deported immediately. The onus of proof that a suspected person was not a Pacific Islander rested with the individual. 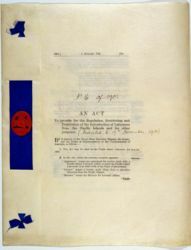 Pacific Islanders mounted a political campaign to oppose the Act. They sent petitions to the King, to the Governor of Queensland, to the Governor-General and to the Prime Minister. The only relief achieved was an amendment to the Act in late 1906 which liberalised the exemption categories. The final deportation got under way in late 1906 and continued until mid-1908. 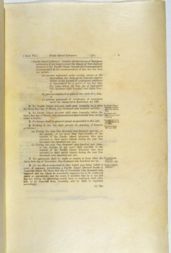 Though this was much slower than the government had planned, the process was eventually completed and the Pacific Island Branch of the Queensland Immigration Department closed on 31 July 1908. While the official number of Islanders eventually allowed to remain was 1654, research indicates that the actual number was much higher, with around 2500 Pacific Islanders remaining in Australia. Almost 1000 people thus avoided the mass deportation set in train by this Act. Detail of the front cover of the Pacific Island Labourers Act 1901 (Cth). Features: The back cover is folded to form a strip on the front, holding the pages together with blue ribbon, with a red wax seal on the front. The assent block, with the signatures and date are on the last page.